ALM HM are the Preferred Partner – Stockist of Aperam for their Uginox Patina & Uginox Top range of material for Roofing & Cladding. UGINOX Patina is available in 0.5mm thickness and various standard widths, 500mm, 580mm, 1000mm & 1160mm. The 0.5mm thickness ‘Nickle Free’ K44 Alloy produces a flatter surface and also assists in reducing the peak pricing element of 316 Alloys thereby maintaining a more stable pricing platform. UGINOX TOP 44 (1.4404) is available in 0.5mm thickness and the same widths. ALM HM stock-hold these finishes. 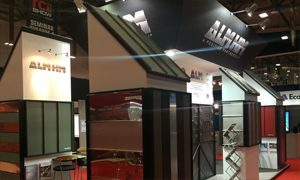 ALM HM are the UK Stockist for Uginox Roofing & Cladding material. ALM HM supply all finishes and keep a large stock of the main products in house. UGINOX Patina terne coated stainless steel has been preferred by architects for its ability to mimic the colour of aged lead sheets. Achieved through an electroplating process with tin on both sides, UGINOX Patina will gradually take on a non reflective, matt grey patina. This patina develops on the surface upon exposure to normal atmospheric conditions. UGINOX Patina is commonly specified on heritage and worship projects as well as modern applications where there is a specific requirement to blend with the historical surroundings. UGINOX PATINA comprises K44 Stainless Steel with an electro-tinned coating on both sides. This material weathers over time, imparting a changing character and a matt grey finish. The tin tones down the stainless steels natural lustre, enabling it to be used on heritage & religious projects as well as modern applications where there is a specific requirement to blend with historical surroundings. UGINOX TOP, low reflective surface finish is achieved through a skin pass process engraving a micro texture on the surface. Uncoated and with a matt appearance, UGINOX TOP can be used in any roofing or cladding application. We also particularly recommend the use of UGINOX TOP on fascia and soffits where natural rain washing could not complete the weathering process of UGINOX. UGINOX TOP Low reflective finish is characterised by a permanent and durable matt finish. It blends into all types of environment, both rural & Urban, traditional & modern, and is suited to all styles of architecture. This material is particularly recommended for facia & soffits where Natural rain washing may not complete the weathering process of UGINOX PATINA. Stainless steel is becoming more and more popular as a roofing and cladding material due to its green credentials, its resistance to corrosion and staining, low maintenance and familiar lustre make it an ideal material for many applications. The architectural possibilities for stainless steel were recognised within only a few years of its discovery early in the 20th century. Proof of this can be found in such well-known structures as the roof of the Chrysler Building in New York and the canopy of the Savoy Hotel in London. For a while, the relative high cost and limited availability of the material restricted its application to flagship buildings of this type for which the cost was a secondary consideration. That perspective has now changed dramatically as the cost of stainless steel in relation to that of competing materials has become much lower, with many new grades and product forms now widely available. No longer is it viewed purely as just a decorative option for facades, shop fronts, lift and escalator panels etc, but, in many instances, it is part of the unseen fabric of a building or structure. Nowadays stainless steel is not by any means expensive when compared to other metals used for the same applications. With green issues and the requirement or want to achieve BREEAM Rating, stainless steels unique properties have been heavily assisting a massive resurgence in popularity when specifying roofing and cladding materials for a buildings outer skin. Schools, hospitals and prisons seem to favour the material as a low to no maintenance roofing and cladding product.